The Central Working Committee of the All Progressive Congress, APC Women and Youth Presidential Campaign team has raised the alarm over alleged plans by the opposition to instigate violence in the South East and South-South so as to use that as cover to alter the election result figures from the two geo-political zones overnight. 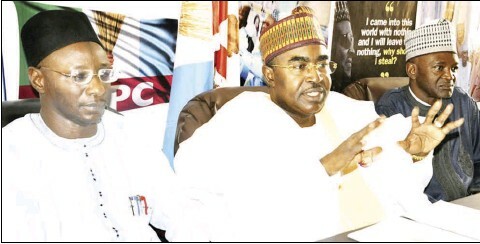 Addressing a press conference in Abuja on Sunday, Chairman of the Campaign committee, Gen. Buba Marwa, called on security agencies and the Independent National Electoral Commission (INEC) to be vigilant and prevent such. According to him, “We will like to draw attention to the fact that there are plans afoot for massive manipulation of results by the opposition in the South East and South- South through the unleashing of violence from tonight onwards with a view to altering election results by using total registered voters instead of accredited voters to change the final result figures. While expressing optimism that the final results would favour President Buhari and the APC, Marwa expressed the appreciation of the campaign team to the president, his wife and other leaders of the ruling party for their support and encouragement throughout the duration of the campaign. “While we await the verdict of history, may I on behalf of the Central Working Committee of our campaign team thank our members, coordinators and full structures, canvassers, door-to-door mobilisers and millions of patriots for their uncommon commitment and efforts towards the success of the President Muhammadu Buhari re-election project. I want to put it on record that your selfless labour has made all the difference in the outcome of the election, which no doubt will be in our favour by the grace of God. “May I also extend our heartfelt gratitude to His Excellency President Muhammadu Buhari, His Excellency Vice President Yemi Osinbajo, our esteemed leader, Asiwaju Bola Ahmed Tinubu, our National Chairman Comrade Adams Oshiomhole, the Director-General of the APC presidential campaign council, Rt. Hon. Rotimi Amaechi and other leaders of the presidential campaign council for the support and encouragement given to our team throughout the exciting and challenging campaign. No doubt, our task was to complement the presidential campaign council and we did just that. “May I salute the rare leadership, foresight, vision and doggedness of the wife of the President, Her Excellency Dr (Mrs) Aisha Buhari, the originator and motivator of this inspiring Women and Youth Campaign Team agenda. We also appreciate the wife of the Vice President, HE Dolapo Osinbajo for her rock-solid support and inspiration as well as wives of governors, candidates and other leaders and members of all the Directorate of the Women and Youth Campaign Team for their tenacity of purpose and great energy. “We thank millions of APC members and supporters who trooped out to vote on February 23, 2019, despite the initial postponement. We thank our agents who stood their grounds to ensure our results were not tampered with and our mandate protectors who kept eagle eyes on the process,” he stated.